The number of hundred-dollar bills in circulation has skyrocketed in the past decade. It could be a troubling indicator for global corruption as high-denomination bills remain a go-to for criminals, given the anonymity and lack of transaction record. “There's certainly enough evidence to say it is an enabler of corruption, but it is also a way for people to keep assets outside of the financial system," says Nicholas Colas, co-founder of DataTrek research. A customer prepares to pay for an order with cash on the first day of retail recreational marijuana sales at the Cultivate Holdings dispensary in Leicester, Massachusetts, on Nov. 20, 2018. 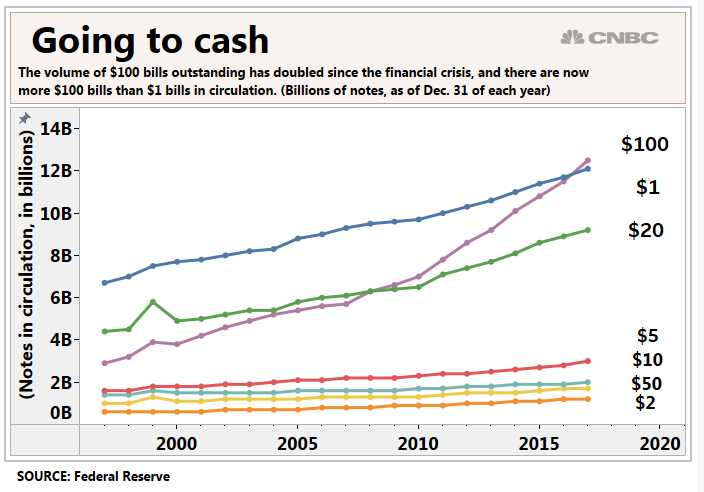 The amount of $100 bills in circulation is surging. And it's leaving some economists scratching their heads. Generally, economists believe the surge is related to people around the world wanting to hoard cash, a similar force that's driven the interest in cryptocurrencies. High denomination, high value currency notes have historically been a preferred form of payment for criminals, given the anonymity, lack of transaction record and relative ease with which they can be brought across borders. Nicholas Colas, co-founder of DataTrek Research, has been down the "rabbit hole of a topic" for more than a decade. He said the growth in $100 bills in circulation is a signal the world is relying on them as a store of value — and still using them for international crime. "It has nothing to do with the U.S. economy and nothing to do with interest rates," said Colas. "There's certainly enough evidence to say it is an enabler of corruption, but it is also a way for people to keep assets outside of the financial system albeit in a kind of bulky way." The number of hundred dollar bills abroad began surging after the Gulf War and U.S. invasion of Afghanistan, according to Colas. Part of stabilizing the region meant replacing local currencies with something, and "that something was the U.S. dollar." Those larger bills also have a longer shelf life than any other form of U.S. cash. Still, Deutsche Bank's Slok said multiple factors could explain the increase in C-notes. "It could be driven by a global fear of negative interest rates in Europe and Japan, or it could be a savings vehicle for U.S. households worried about another financial crisis, or it could be driven by more demand from the global underground economy," Slok said. A 2018 research paper from the Federal Reserve Bank of Chicago estimates that 60 percent of all U.S. bills and almost 80 percent of all $100 bills are now overseas. That's up from 15 to 30 percent around 1980, according to research from Federal Reserve Board economist Ruth Judson. She found that economic and political instability contribute to this demand. Projecting future demand for U.S. currency is "challenging" and depends on how quickly the economy grows, interest rates, new payments technologies, and on whether people in other countries continue to see U.S. dollar bills as a useful asset — "all factors that are, to say the least, uncertain," according to the Chicago Fed. A surge in digital payments may be contributing to the lessening demand for lower denomination bills. Rising smartphone use, a shift toward online shopping and improvements in network bandwidths pushed global digital commerce volume above the $3 trillion mark in 2017, according to a recent McKinsey report. That is on track to more than double by 2022, according to McKinsey. There has been pressure to get rid of high denomination notes to curb international crime. Lawrence Summers, former Treasury secretary and director of the National Economic Council in the White House, has argued for abolishing $100 bills. Summers wrote an op-ed in The Washington Post in 2016 titled, "It's time to kill the $100 bill." "A moratorium on printing new high denomination notes would make the world a better place," Summers said, citing its potential for crime. "Here is a step that will represent a global contribution with only the tiniest impact on legitimate commerce or on government budgets. It may not be a free lunch, but it is a very cheap lunch." He referenced a Harvard research paper written by former Standard Chartered bank chief executive Peter Sands, who argued to eliminate high denomination, high value currency notes. "By eliminating high denomination, high value notes we would make life harder for those pursuing tax evasion, financial crime, terrorist finance and corruption," Sands wrote. The global illicit money flows were "staggering" and fuel crimes from drug trafficking and human smuggling to theft and fraud, Sands said. He estimated that depending on the country, tax evasion robs the public sector of anywhere between 6 percent and 70 percent of what authorities estimate they should be collecting. And despite "huge investments in transaction surveillance systems, and intelligence, less than 1 percent of illicit financial flows are seized. Soon after that paper was published in 2016, the European Central Bank announced it would stop producing the 500 euro note, citing concerns it could facilitate illegal activities. Despite similar pressure on the Fed, Colas isn't optimistic it will take the same steps as long as cash distribution is still profitable. "The Federal Reserve and Treasury make 99 dollars for every $100 dollar bill they print and sell offshore," Colas said. "There's a natural desire to keep printing these things — the U.S. government makes a lot of money selling them."